Pen and ink drawing by Sir Charles D'Oyly (1781-1845) of a Muslim tomb near the great banyan tree at Hajipur in Bihar, dated 16th March 1824, from an album of 80 drawings of views in Bengal and Bihar taken between January 1823 and May 1825. This image is one of a group of miscellaneous sketches which were made either at Patna, D'Oyly's headquarters, or at near-by Hajipur in March and October 1824 and May 1825. Banyan trees are sacred to the Hindus. As it is forbidden to cut their trunks or branches, they can grow to an immense size, providing a useful source of shade from the intense summer heat. Banyan trees send out aerial roots which may embed themselves in the ground and in turn become new trunks thus continually increasing the tree's size. The trees are also considered a symbol of fertility. 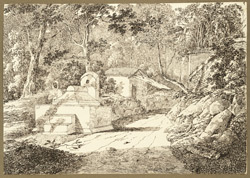 In this sketch a Muslim tomb rests in the shade of the banyan.